You see that poster? Do not let that poster fool you. In no way do that tattooed guy or the iron-clad samurai have the big parts the poster implies. 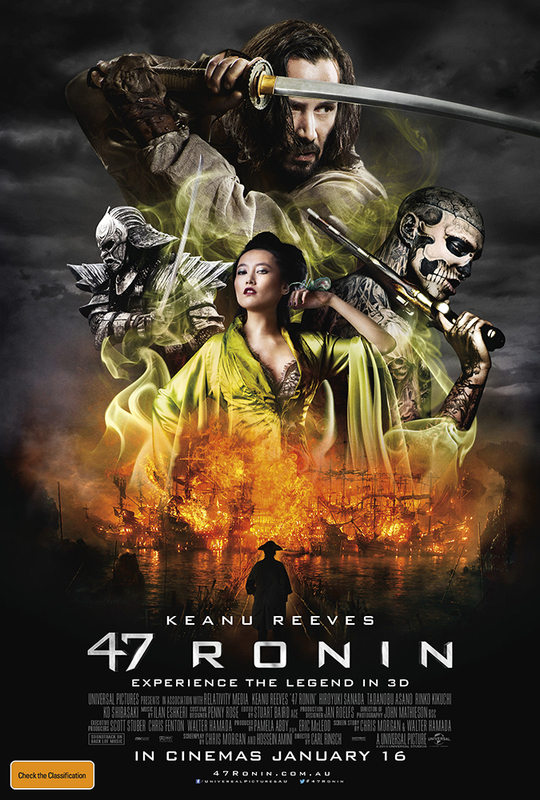 This is the tale of the 47 ronin…or the 46 ronin and the half-Japanese demon played by Keanu Reeves, who seek revenge for their slain master. The movie opens with a young Caucasian boy, Kai, running through a forest. He collapses in a little brook and is soon found by Lord Asano Naganori (Tanaka Min), daimyo (feudal lord) of the province of Ako, and his group of samurai, led by Oishi (Sanada Hiroyuki). Lord Asano takes Kai in despite Oishi’s attempt to kill the boy for his apparently demonic nature. Kai grows up an outcast in the long shadow of the palace of Ako and its samurai, loyal to Lord Asano and in love with his daughter, the Lady Mika (Shibasaki Kou). Fast forward several years, Shogun Tokugawa Tsunayoshi (Cary-Hiroyuki Tagawa) and rival daimyo Kira (Asano Tadanobu) come to visit Lord Asano. During a demonstration between the best samurai of the two lords, Kai is further cast out after impersonating a samurai. In the evening, through dark magic, Kira’s Witch (Pacific Rim‘s Kikuchi Rinko) tricks Asano into assaulting Kira, resulting in the Shogun ordering the former to commit seppuku (stabbing himself in the gut, an honorable death). The Shogun pronounces Asano’s samurai as ronin and orders them not to come after Kira on pain of death, then pronounces Mika engaged to Kira so that strife will not grow between her lands and his. After the Shogun leaves, Kira orders Oishi thrown into a pit. One year later, the story really begins. Normally, any dramatic adaptation of the 47 Ronin story will fall under a special body of work called Chushingura. But if I were Japanese and had any say in what goes on in Japanese culture, I wouldn’t include Carl Rinsch’s directorial debut in that body of work. Why? It’s not just because the very presence of a white guy (I don’t care if they called him half-Japanese and half-English, his accent’s still American) skews the whole “To know the tale of the 47 ronin is to know all of Japan!” thing. Granted, as the movie progresses, Kai shares the screen with Oishi, even backs down a little at some parts (a feat for a Hollywood film). It’s that you can tell right off the bat which parts were probably insisted on by Hollywood film producers (who may have thought that American audiences need a white guy to relate to for a movie about another culture to be interesting) and which parts were true to the source story–and I’m willing to bet that you can tell which part dragged the story down. Look, I love fantasy. The wonders of computer animation never cease to amaze me, and this movie delivers on that. The evil liveliness of the Witch’s silks, as well as every other manifestation of her powers–be they reptilian or insectile–is proof enough of this. Props also to Lady Mika’s out-of-this-world kimonos, as well as the tangle of galleons making up the haven of pirates (who don’t spend more than 10 minutes onscreen). In short, the movie is not lacking in spectacle department. But beyond spectacle, what has it going for itself except for well-choreographed fight scenes and a very strong source story that needed no embellishment? 47 Ronin would have been cool if it wasn’t trying to be too cool.